Odon and Elisabeth Wagner are pleased to present a special exhibition of Chinese Textiles collected during their personal visit to China. The presentation of this exhibition coincides with a major conference for the Textile Society of America, October 11 to 14, 2006, co-hosted by the Textile Museum of Canada and the Harbourfront Centre. 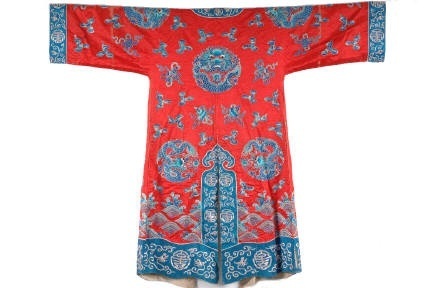 This exhibition features more than forty uniquely handcrafted textiles, predominantly from people of China's ethnic minorities. A unified country of many nationalities, China boasts more than 50 independent minorities, inhabiting remote mountain, river, grassland and desert regions. This fine collection will display textiles from the Li, Yao, Dong, Miao and Yi peoples, some dating back to the 19th century. These textiles are not only exquisite examples of decorative artistry but remain as tangible cultural artifacts, documenting the lives and history of the people who make them. Many of these independent minorities have no official written language and the patterns and designs in the weaving read as the symbols and narratives of a rich cultural history. Women in these villages learn embroidery, weaving and batik from an early age, and these costumes can take years to complete. Often their completion marks a rite of passage, such as coming of age, or ceremonial rituals including engagements, marriage and childbirth.